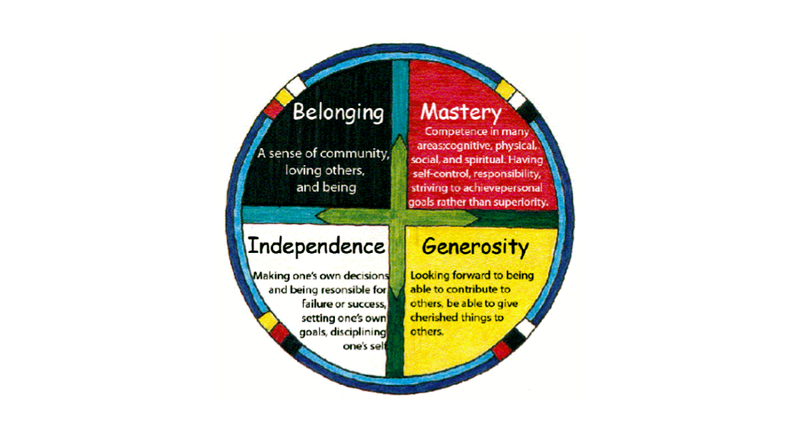 “The Circle of Courage is a model of positive youth development first described in the book Reclaiming Youth at Risk, co-authored by Larry Brendtro, Martin Brokenleg, and Steve Van Bockern. The model integrates Native American philosophies of child-rearing, the heritage of early pioneers in education and youth work, and contemporary resilience research. The Circle of Courage is based in four universal growth needs of all children: belonging, mastery, independence, and generosity. Visit Reclaiming Youth International for more.